Banksy has been a very popular artist in the UK and around the globe because of the rebellious nature of his themes and the way he expresses himself through graffiti. But it looks like this beloved rule-breaker is finally realizing that even he needs to abide by the law if he wants to continue working as an artist. 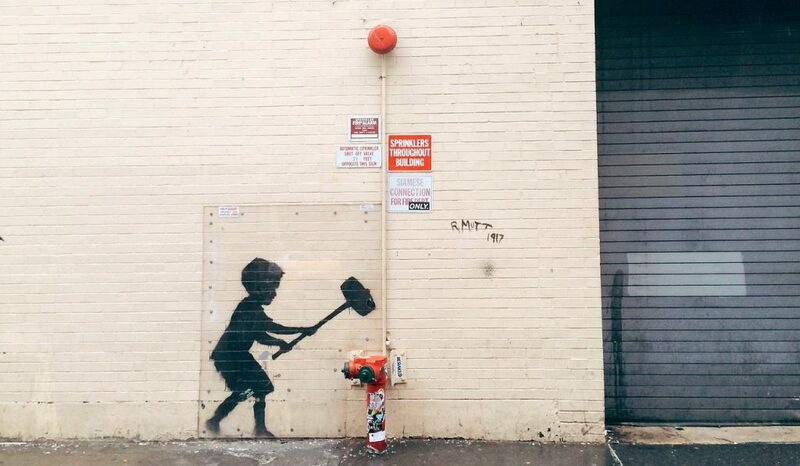 Banksy has been the target of several unauthorized exhibits recently. And you can see the appeal: a person who is hiding their name while breaking the law to create art would never think of appealing to the law to protect his rights. In short: all that rebellious attitude is essentially Banksy waiving his rights protected by law, and it is costing him. People expected Banksy to stick to his guns. That was his appeal after all. So it is a surprise, and it would probably make Banksy’s critics smirk, to see the artist eventually sell out and appealed to the law to protect his trademark when he found out that a museum doing an unauthorized show of his works was selling unofficial Banksy merchandise. Even more surprising is that he actually won. The Mudec Museum launched an exhibit in November last year titled “The Art of Banksy: A Visual Protest” which was supposed to run until April this year. This exhibit, like all the other recent ones, are not authorized by the artist and cites it is because “Banksy continues to defend his anonymity and independence from the art system.” Those involved in this exhibit probably worships Banksy as much as his British cult. The museum even went as far as to sell some Banksy merchandise for the visitors. Somehow, this caught Banksy’s attention. Now Banksy has been known to be a critic of capitalism, consumerism, and authority, just to name a few. He is known to be that guy who once painted “copyright is for losers.” But this time, he sang a different tune and took action against the museum. Before 2018 was over, Pest Control, the one doing all the legal works for Banksy, enforced their rights to stop the museum from selling the unofficial merchandise. The Milan court that was handling the case ruled in favour of Banksy, except for any promotional materials which only serves to be informative about the artist. Laws for Thee, But Not for Banksy? So will Banksy be a good boy now and follow the law? Or will he be breaking them, then enforcing them to suit his needs? If he does choose to be a good boy, will he finally go after all those people and museums profiting from his works? If he did, he will eventually need to reveal his identity, and that will be quite a blow to his bad boy act so that’s actually the more unlikely scenario. It is more likely that he will only come after people and museums who are selling merchandise that he never approved. So museums, like the one in Russia who did an unofficial exhibit of his works, will remain safe. Copyright laws are important, especially for artists who are looking to turn their art into a profession. But copyright laws are not like an absolute solid wall. They provide a few instances of exception to allow derivative works and freedom of expression to the artists. Freedom of expression and freedom of speech are two of the most important rights people have. Even for a person like Banksy, who completely disregards the law most of the time, he ultimately cannot ignore the ones that provide protection to his rights. This isn’t a bad thing, but it would be the very opposite of everything Banksy has stood for at this point. 1st Image: A Banksy work, via Pixabay (https://pixabay.com/photos/banksy-graffiti-painting-2507475/). 2nd Image: Another Banksy work, via Pixabay (https://pixabay.com/photos/street-art-urban-banksy-wall-boy-606379/).